Churchill – Returns for a 2nd Week! Fearful of repeating 1915’s invasion of Gallipoli, Churchill attempts to stop 1944’s planned invasion of Normandy. Only the support of his wife can halt the prime minister’s physical and mental collapse. Paris Can Wait – Married to an inattentive movie producer, Anne finds herself taking a trip with a business associate of her husband. What should be a seven-hour drive turns into a carefree two-day adventure, giving her a new lust for life. Beatriz At Dinner – Held Over for a 2nd Week! An immigrant from Mexico has drawn on her kindness to build a career as a health practitioner in LA. She collides with her polar opposite, a self-satisfied billionaire, at a wealthy client’s dinner party. The Hero – Returns for a 2nd Week! An ailing movie star comes to terms with his past and mortality. Starring 2 x Golden Globe nominee Sam Elliott, 2 x SAG Awards winner Laura Prepon, Krysten Ritter, and Nick Offerman! 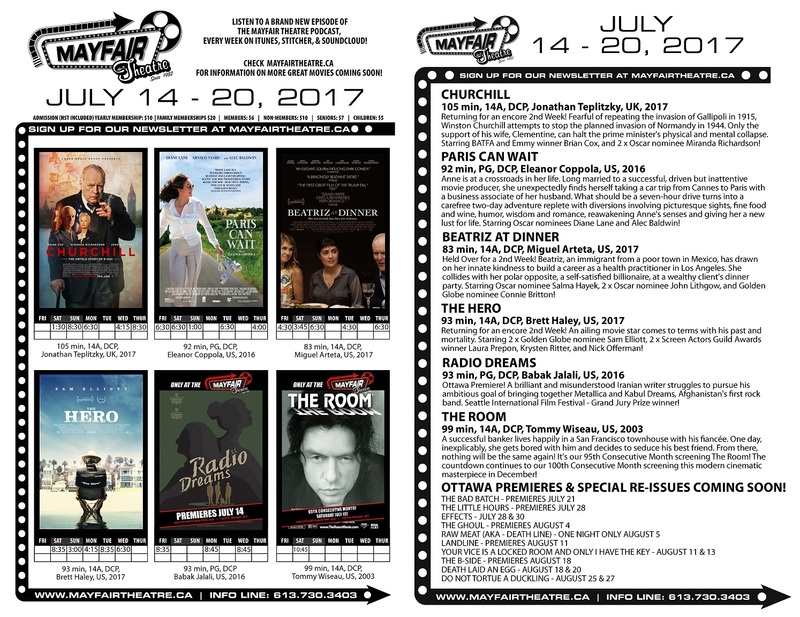 Radio Dreams – Ottawa Premiere! A brilliant and misunderstood Iranian writer struggles to pursue his ambitious goal of bringing together Metallica and Kabul Dreams, Afghanistan’s first rock band. SIFF – Grand Jury Prize winner! The Room – It’s our 95th Consecutive Month screening The Room! The countdown continues to our 100th Consecutive Month screening this modern cinematic masterpiece in December!